Kevin Patton: Alexa, please teach this afternoon’s A&P class for me. Alexa: Sure. For what time? Alexa: I’ll schedule A&P class today at 3:00 P.M., okay? Kevin Patton: Okay. Alexa, please create a case study for next week’s class on blood pressure. Alexa: I added case study for next week’s class on blood pressure to your to-do list. Kevin Patton: Alexa, play the AP Professor podcast. Alexa: Welcome back. Would you like to continue where you last left off with Why Spaced Retrieval Practice is Your Most Powerful Teaching and Learning Tool, TAPP Radio one. Alexa: Here’s Why Spaced Retrieval Practice is Your Most Powerful Teaching and Learning Tool, TAPP Radio one. Aileen: Welcome to the A&P Professor. A few minutes to focus on teaching human anatomy and physiology with host, Kevin Patton. Kevin Patton: In this episode I mention the new Alexa skill for the podcast, I discuss some free resources from the National Science Foundation, and I go through nine strategies for teaching the skeleton. Kevin Patton: For those of you who have been following me on social media, or subscribed to the blog newsletter, or my Nuzzel newsletter, you already know that the A&P Professor podcast is now available as an Alexa skill. What that means is that if you’re among the rapidly growing number of folks who use Alexa to listen to music or to control your home or office, or to ask Alexa questions or to tell you jokes, you can also tell Alexa to play any episode of this podcast or navigate any amount of time forward or backward in an episode, change episodes, pause and return, and more. All you have to do is tell Alexa, “Enable the AP Professor podcast,” and you’re ready to roll. Kevin Patton: By the way, the invocation phrase that you need to use with Alexa does not pronounce the ampersand, that little and symbol in the podcast name. So it’s AP, not A and P. Even though Alexa will say the and, it won’t often work if you say it. And don’t ask me. I don’t get why it works this way either. And don’t forget the podcast at the end. Just the AP Professor by itself won’t work. You have to say the AP Professor podcast after you say Alexa’s name of course. Or computer, or Amazon, or whichever option you use to call Alexa. Kevin Patton: Want to know more about how to enable the Alexa skill? Maybe watch my goofy video in which I activate the skill on the Amazon Echo in my office. Well then go to the podcast page at theapprofessor.org to find the button for the Alexa skill, or simply click the hyperlink in the show notes for this episode or on the podcast page, the episode page in the podcast section of the website. Kevin Patton: Do stop by the Amazon page for our skill sometime soon and rate and review the skill. Any reviews and ratings that you give this skill, or give the podcast itself when you’re listening in a podcast app, really help me a lot. And you know how much I appreciate your support. Or if you’re close to your Alexa device right now, I can enable the skill for you. Yep, just set your smartphone or laptop or whatever device you’re listening on right now to speaker, and make sure the volume is loud enough for Alexa to hear. Pause the episode until you’re ready. Are you ready? Alexa, enable the AP professor podcast. There. That should’ve done it. Kevin Patton: Yeah, I realize that many of you don’t care about this Alexa skill right now. I hope you’ve already just skipped through this segment already. But if you’re still here, mark my words, it won’t be long and you’ll be looking for skills to add to your new Alexa enabled device, or car, or spaceship. I’m just saying. Kevin Patton: As you know, I like to use this podcast to pass along information about teaching and learning objects that we can use in our courses to help promote the success of our students in learning the core concepts of human anatomy and physiology. Today I have one that I want to pass along and it comes from the National Science Foundation. It’s their multimedia gallery. Now as you may know, any images or other media that are produced in the course of the normal work of most US agencies is automatically in the public domain. That’s the law. Now of course there are exceptions. There’s levels of secrecy and all kinds of other exceptions. But there is a lot out there. The trouble is where do you find it and where do you find a curated assembly or gallery of it? Well, here we go, the multimedia gallery from the National Science Foundation. Kevin Patton: Now all you need to do is go to the hyperlink in the show notes and I have a link to the gallery. When you go in there, you’re going to see it’s a pretty large number. I’m looking at the main page now and it shows that there are 6,844, the number might be bigger by the time you get around to looking at it, so it’s going to take a little bit of skill in searching through, whether you were looking for an image, a video, audio, but there are some really nice little videos that can be embedded in our course, either in a presentation, online presentation or in class presentation, or various other learning materials, lots of images that we can use in various ways, even audio files. Kevin Patton: Now there’s all kinds of stuff. It spans the different topics in science. There’s physics and chemistry and all that stuff in there. But if we look around, we can see a lot of anatomy, some physiology, some medical or clinical applications of basic A&P. So go ahead, look around in there. And if you find one that is particularly useful or surprising or exciting to you, we’ll try to share it here on the podcast. Kevin Patton: The skeleton. In the typical undergraduate A&P course this an early and very scary challenge for most students. When we give them that long list of bones and markings or features of those bones, it can be well very daunting and students don’t know whether they’re going to live through it or not. But they do, and they’re usually pretty successful if we help them along and they really work at it. So then it becomes a source of great satisfaction, especially as they start applying it to later learning for example when they get to the muscles and learn how important knowing all those bone features are in determining where the muscle attachments are, or even in other parts of the course when they’re learning the locations of structures throughout the body, including the internal organs and see how useful the bones and bone markings are or landmarks, to service landmarks to help them locate these things. Kevin Patton: Over the decades I’ve discovered that there are a few simple little things that we can do as teachers to help the students along in that early challenge to make it a little more effective, maybe even a little bit easier for them to get through it, and to make sure that they’re retaining that information in the long-term because that’s why they’re doing it. Memorizing it just for the test really doesn’t get them very far. It’s kind of a waste of time as far as I’m concerned. I’ve come up with nine simple little things that we can do. Since there are nine of them, we’d better get moving if we’re going to get done in a reasonable amount of time. Kevin Patton: The first thing is, is to chunk it. I think that if we break down the list into smaller lists, it’s less daunting, it’s less scary, and so we’ve reduced some of that anxiety, which we know can affect learning where some students just turn off and say, “I’m never going to be able to do this.” If we chunk it, that’s a smaller list. And if we’re able to chunk it into small sub tests rather than one big giant test at first, in a lot of courses and I’ve done this is give them one big skeletal test and that’s it. What I’ve learned is that if you break it down and give them sub tests and then do a comprehensive list or a comprehensive test at the end of that, then it works much, much better. Chunking it, number one. Kevin Patton: Strategy number two, start off with an overview of the organization. Most of us in lab give a few minutes of introduction to a new topic, and when I do that I really emphasize even though this is in their book and in their pre-lab materials and so on, I really emphasize in person using a skeleton right in front of me, showing them the difference between the axial skeleton and the appendicular skeleton, and remind them what, where the word appendicular comes from and show them what the appendages are, and just briefly go over the upper extremity, low extremity and just give a few basic principles in terms of how the skeleton is organized. Because if they have an over arching organizational framework, conceptual framework of the organization of the skeleton, that’s going to help them put this big long list that we’ve just given them into some kind of a sensible structure that helps them get a handle on things and move forward. Strategy number two is give an overview of the organization of the skeleton. Kevin Patton: Strategy three, start with the types of markings. When I first start teaching the skeleton, I just threw them out there at that point and said, “Look, here is your list of stuff.” They’re looking at these names as if they’re written in Martian, like where in the world am I ever going to figure out these gobbledygook names. But I later learned that if I start off with a list of just the marking types, so I would list things like foramen, condyle, epicondyle, things like that, then and told them what they were, then later on when they get to the lateral epicondyle and the medial epicondyle and so on, they know what they’re looking for because they know what an epicondyle is. They know what a condyle is. They know that foramina is the plural of foramen. Kevin Patton: It’s sort of like when you’re studying geography. If you hand somebody a map and say, “Well, here’s a list of things that you need to be able to locate on a map, and I’m going to test you on this,” and they have no idea what a lake is, they have no idea what a river is, they have no idea of the difference between a mountain and a valley, then they’re going to have a really tough time just finding those things on the map in the first place. And if they never really get that that’s what those words are, that they’re generic terms for a general kind of feature on the map, then they’re probably going to have a really hard time putting that into their short-term memory, much less their long-term memory. Kevin Patton: So really what we’re doing when we learn the markings of the skeleton, we’re learning the geography of the bones, of the skeleton. Why wouldn’t we want to start them off with a general understanding of the general kinds of markings that there are? Kevin Patton: Now if you go to the show notes, I have a hyperlink to a list of these markings that you can print out and use for your students, or there’s even an interactive table online that you can go to or link for your students to go to. You don’t even have to do any of that. You can just point them to that table and they can go through those lists of markings and it even has examples of different types. It’s more examples than you’re likely to have them be learning in their class, but it gives them an idea of the fact that are different kinds of condyles for example and things like that. That was strategy three, start with the types of markings, explain the types of markings. Kevin Patton: What about strategy four? Strategy four is related to that and that is have them look at the meanings of the names of the bone markings. Not only what it means when it says foramen, and know that that is a hole and so they know they’re looking for a hole, but what kind of foramen. Is it foramen magnum or ovale or rotundum? Some of those names are so close to the English that it’s easy to figure out. Like ovale is oval, and rotundum is round. But some of them aren’t so easy. So if they start focusing on that, then in learning the names or the literal meanings of some of those names, those are built in mnemonic devices. Kevin Patton: Of course a mnemonic device as anything is going to help somebody remember something. Those names, foramen ovale, meaning oval hole, that’s a built-in mnemonic. That is it’s telling them exactly what to look for. That’s strategy four, know the meanings of the names. Oh, yeah, by the way, look in the show notes for a hyperlink for a list of those. I have a table that has many of the major markings in bone features, even the bones themselves listed in that table that you can provide for your students that gives them not only the name but the literal translation of the name. Anyway, that’s another little useful tool if you want to use it. That was strategy four. Kevin Patton: Strategy five is explain why they need to know the markings. Now I just mentioned this a moment ago as an aside because we all kind of know why they need to know the maze of all the bones and markings, because they’re going to need to know the muscle attachments and they’re going to need use them for anatomical landmarks for all kinds of other structures. Not only that, but they’re going to run into these bone names and marking names more often than they think in later courses and in their clinical clears. Kevin Patton: So if we start out saying, “Look, I’m not just making you memorize these things because I think it builds character to memorize a long list of things,” but explain that look, there’s a reason why we’re going through all of this, there’s a reason why you need to have this information instantaneously available in the back of your memory somewhere and be able to retrieve that. That explanation is really going to help with their own self motivation in terms of sticking with this fairly daunting process of learning all the bones and their markings. That was strategy five. Kevin Patton: What’s strategy six? Well, this is something that maybe you have some other way of doing this, but I’ve found it to be very, very helpful, and that is I take the diagrams that are provided from the publisher of my textbook that are normally used to build a PowerPoint slide or maybe to be used in a quiz or something like that, and I use them for that reason too. But what I will often do is print them out in an enlarged format in monochrome, that is black and white, on very large paper. Kevin Patton: Our copy center has 11 by 17 paper. That’s twice the size of a typical sheet of paper that we’d use in a binder or for a test or something like that. They’re pretty large sheets. What I will do is use the unlabeled version of the skeleton art that’s from my textbook, put it on there in monochrome, and print those out in my copy center, and then have those available to my students. Then they can take those skeletons and they can label them. They have their own little paper version of the skeleton, skull, the major regions of the skeleton, maybe even and some of the more complex bones, just the individual bones. Kevin Patton: They’re going to have several sheets there, and they can go in and pencil in their own labels. They probably want to use pencil because they’re going to make mistakes or they’re going to find that the lines are overlapping one another and they have to spread their labels out a little bit. So allows them to edit very easily. Then at some point they might want to even color in the different regions, like color in that condyle and this other condyle and that epicondyle and this foreman and so on, and do a color key type thing. There’s all kinds of possibilities there, so it’s basically a kind of virtual dissection when you do that. Like I said, my students have found it very useful. That was strategy six. Kevin Patton: What about strategy seven? Well, this is something you probably do already, and that is have them make their own flashcards. Now there are a lot of prepared flashcards that they can get online or buy in the bookstore or on amazon.com, or who knows where, and those are all very hopeful too. I think though that making their own flashcards where they take a photograph of the skeletal material that we’re using in class or the skeletal models that we’re using in class, take their own photo with their smartphone if they have that available and make flashcards using that. Or make photocopies from their textbook and cut them up into little pieces and put that on a flashcard so that they can quiz themselves. Kevin Patton: Maybe have a skull or part of a skull on one side of the card that is highlighted where only one bone or one region of one bone or bone marking on that phone is highlighted, and then they flip over to the other side and see what the name of it is. They can practice anytime or place that they want. I think that making their own flashcards itself is a process that is going to help them get this into their long-term memory. It’s going to be a multi-sensory process, a kinesthetic process that is going to help store that information so that there it’s easy to retrieve later. And the more they review them, again, the easier it’s going to be too. Go back to episode one of this podcast series. That’s where I go into space retrieval practice and how useful it is. Well, here is an example, flashcard, one of many examples. That was strategy seven. Kevin Patton: What about strategy eight? Strategy eight is to do whatever I can to give them easy, easy, easy access to the skeletons and skulls and individual bones, whatever it is that I’m going to have on the lab practical quiz or quizzes, I want them to be able to go in and practice with that. The lab at my community college, so back to back with lab classes, and in between classes it’s usually locked up and not available for the students to get in there. They need to have some way to go in and review if I tell them to practice, practice, practice, but all they have are pieces of paper and flashcards, which are useful up to some extent, but if what they’re going to be tested on are actual skeletal models or skeletal specimens, then it’s only half a practice, it’s not really the same. Kevin Patton: It’s like in soccer practice. I can practice in my front yard, trying to hit the tree with the soccer ball, but it’s not the same as playing against another soccer player. I’m going to need to do that at some point if I want to expect to win the game. I can’t just walk into the game, never had played against another human soccer player. We need to do that too. We need to give them easy access. Kevin Patton: At our community college what we’ve done is make sure that there are skeletons and skulls in our learning center where students can go in and study the materials there. There’s other things they can look at when the time comes as well, but that would be an example of how to do that. It pays I think to really go out of our way, maybe even buy extra materials out of our budget if that’s possible to give them easy access, because if we don’t, then I think it’s not really giving our students a fair shot at learning for the long-term. That was strategy eight. Kevin Patton: Strategy number nine and the last one that I’ll talk about today, and that is drill them often. Now I use clickers, that is astute response system, and that’s a topic for a later episode. I want to get into how clickers can be used in lab classes. But you can do this. At the end of every lab class, you can take 5 or 10 minutes to put up some photographs of bones or whatever with some little area circled or a little arrow pointing to it and have them use their clicker to quickly identify. And you can, you want to do it fast because you don’t want them guessing, you want them to know it right away. It’s a low stakes competition that students by the way have done this a lot, the students love it. As a matter of fact, I’ve had students to ask me to make lab classes longer so they can spend more time doing these drills. But you can get a lot of them done in 10 minutes. You go through them really fast. Kevin Patton: Use a timer. I built the timer into the slide I use for my clicker questions so that they only get 5 or 10 seconds. They’re a little bit slower at first and then as the weeks go by and we learn the skeleton more and more deeply and we’re getting better at doing these reviews, then they can go faster. The students like that because they can get it wrong anonymously and they can get it wrong when it doesn’t count for anything, and that helps show them where they’re weak and that they really don’t know it as well as they know it. It’s like a practice test and that’s really good. That was strategy nine. Kevin Patton: I said there were nine strategies but I’m giving you a bonus strategy, the tenth strategy is give them time. 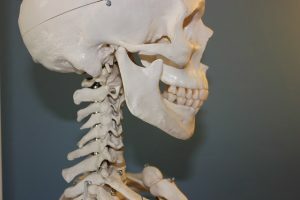 A lot of people try to compress learning the skeleton into one or two weeks in the lab and that’s it, and expect them to do all of this learning and learning for the long-term in that short space of time. Now it’s okay to spend only one or two weeks in the lab class working on the skeleton, but I wouldn’t test them then right away. Well, yeah, maybe do some preliminary tests, some sub tests, but give them a little bit more time beyond that before they actually get their final test on the bones. Maybe take just a few minutes in subsequent lab classes even though you may have moved on to muscles or some other topic in lab, just spend a few minutes to review and answer any questions the students have that remain about the skeleton so that we can help them learn it slowly over time, which is really the only way it’s going to get into their long-term learning. Kevin Patton: Man, that’s a lot to give you in a short period of time. Now we know what the students feel like when we’re trying to get a lot of bones and bones markings into a short period of time in our semester or trimester. If you have other hints, I’m sure you do, have other hints how we can help students learn the skeleton, then please do email me or call the podcast hot line, which is 1-833-lionden, L-I-O-N D-E-N, and let us know and we’ll share it on the air or on the podcast. We’re not really on the air, are we? Yeah, I guess we are on the air. Aileen: The A&P Professor is hosted by Kevin Patton, professor, blogger, and textbook author in Human Anatomy and Physiology. Kevin Patton: Some names and identifying details in this episode may have been changed to protect the privacy of individuals. Could be that Kevin isn’t even my real name.